Air Asia India has begun direct flight between Chennai and Bhubaneswar. I had Orissa on my radar since years but couldn't book due to inconvenient one stop flight timings. 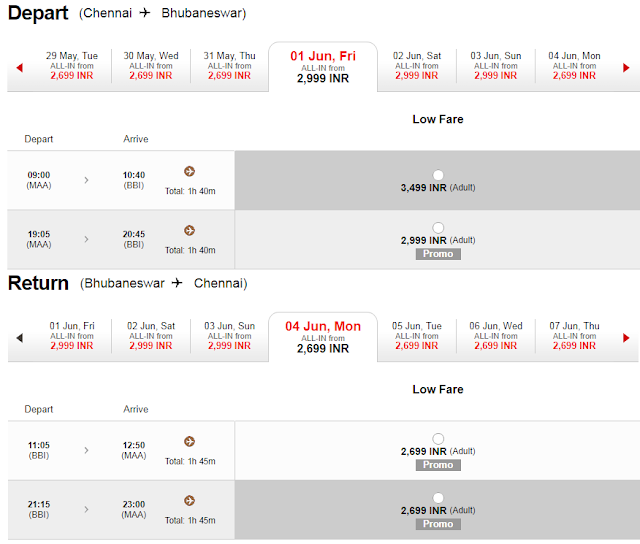 While lowest advertised fare is Rs 1299, I am seeing a normal one way fare ranging around 3k INR for most days. May be I was little late- this announcement happened yesterday- should wait for next sale may be. INR 3000 is not cheap- it is at par with what few other airlines offer- like Indigo. Air Asia India had stopped flying to Chennai after Kabali. Good to see them resume their Chennai operations. Orissa has lots of places of interest- Puri Jagannath temple, Chilika lake, Konark Sun temple and so on. And for Bhubaneswar people planning to visit Chennai, very warm welcome. Here's a complete set of attractions around Chennai that you can consider exploring. I have never traveled by Air-Asia. I usually choose Indigo or Spicejet and mostly I travel from Kochi to Chennai and back. Will try Air Asia if they have a service between Kochi and Chennai.